My first report of a very nice holiday which turned out into a roadtrip..! We left saturday eve, because we were worried about my little girl having to cope with such a long trip. We left at 7.30pm so she could sleep all night long whilst driving and since t˚’s are a lot lower at night it would mean better conditions for the engine in terms of cooling. It was a long trip, specially when both lady’s fell a sleep, and so I was off for a quick nap as well.. The next day we arrived .. quite knackered .. after a 15hr drive! 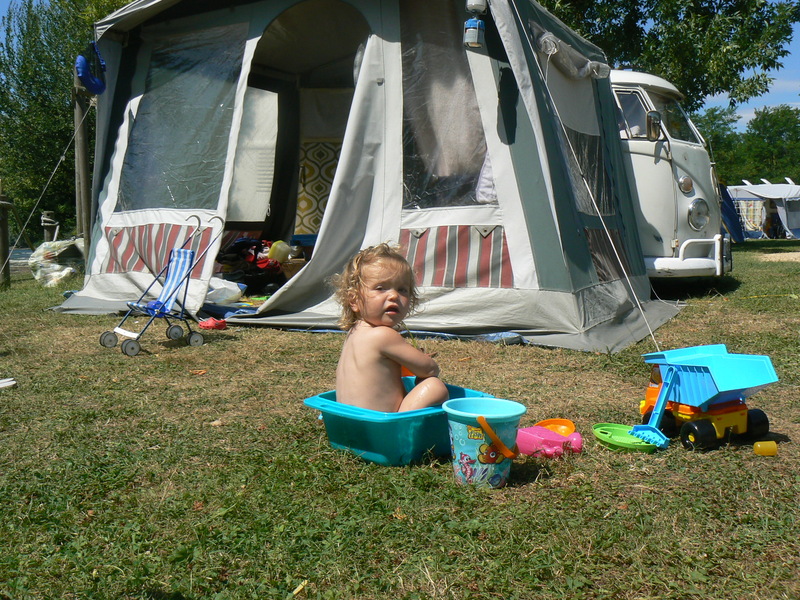 We spent our first week in Lalinde a little village in the Dordogne region on a campsite and parked right next to the river. At the the end of the week Sam’s grandparents arrived and took her along their trip home so we could have another week to go to the coast and try some surfing..
We left to Lacanau but due to a big surf contest the place was over crowded and so we decided to go a little more southwards and ended up in Biscarosse..Great place were we had a few nice party’s and very little surf because we had to make a run for an upcoming storm. We then got the very impulsive idea to drive from the west to the southeast coast.. should make it in about 4hrs we thought.. right..? NoT! After an intensive 8hr drive through the rain and little sleep we arrived in Cap d’agde near to Perpignan. We were soaked, the safari windows leaked so hard that at some points it looked like a little waterfall coming down on my knees .. Luckily the weather was a lot warmer here and we took the opportunity to dry out the whole van and all the beach towels we used for the leaking safari’s..
To cut a long story we went 14 days and drove about 3715km without a single problem ! We cruised at 100km/h and used± 11l/100km. All ready to leave at home in Belgium! A quick nap on a motorway petrol station ..
And another pitstop along the way.. Camping in Lalinde next to the river. A trip to Cadouin were we had lunch and ..
Found a Renault C4 which was awaiting a resto. There’s alot of caves around so we decided to visit one.. Under a bridge in Limeuil ..
And back on the campsite. As from here we went further on our own and started the roadtrip, we skipped campsites and slept somewhere on the side of the road..
Only 1 other splitty campervan crossed our way, not even on it’s own power.. Lovely bus, the owner restored it himself and only finished it 5 months ago! If you think there’s a lot of crap on the roof well there’s a lot..
What a view…. This must’ve been the last minutes of the great weather we had . A bit of a blury picture but it gives you a good impression how you live when it’s raining cats and dogs, a large canvas covering your bus preventing the rain coming in, all your gear (including surfboard)stuffed all over the van and you’re trying to cook something.. .. nice..